OK – Thrill Seekers and Ghost Hunters, this one is for you. Evil Intentions, Elgin, IL, is located in the abandoned Elgin Casket Company. This very building has been witness to crimes, including murder, cult activities, unexplained activities, and has a very dark and haunting past. Built in 1890 on top of a once overcrowded cemetery, where remains were dug up and moved to a new location. It started out as the Western Thread company, but in 1940 was taken over by the Elgin Casket Company. After only a month in operation, five mutilated bodies were found in the basement storage area and this crime was never solved. In 1963, a casket for John F. Kennedy was made to transport his body from Dallas to Washington. In 1977, there is a report of a cyanide spill, the city is forced to close the river and Elgin Casket Company is fined for endangering the lives of citizens. Between 1949 and 1982, reports of escapees from the nearby mental institution are seen on the grounds but never found and groups of figures dressed in cloaks are sighted and it is later discovered that cult activity was a regular occurrence. The building is now used September through October as one of the scariest Haunted Houses in Illinois. Some nights, you can wait in line for hours for this creepy adventure. The owner, Mike, and many of his regular employees have reported numerous unexplained events while setting up the building for this event. Employees have heard voices, seen shadow figures, been pushed, pulled, scratched by something unseen, and have even quit, left the building, never to return. Paranormal Investigators have spent nights here and detail their strange events. You can watch an investigation by Chris Fleming on the Evil Intentions website. You can hear for yourself the responses captured on the spirit box. Evil Intentions now offers the public a chance to investigate this haunted building for those brave enough to sit alone in the dark. I was invited out on June 30, 2017, along with 2 other people. I was told to be there at 10:00 pm, holding my breath and a cross in my pocket, I actually showed up. We walked through the building with the flood lights on as owner, Mike, explained the haunted history and pointed out the investigation locations. We were shown the location where Paranormal professional’s and Psychics have reported there is a portal to hell. At this point, I started to feel a bit nauseous, I blamed it on my nerves, even though there are reports of spirits being able to make people feel sick or pain. The Hallway. Main floor. There are reports of capturing the voice of a young boy, Jacob and a dark more sinister male. Many sightings of shadow figures in this location. The Mannequin Room, connected to what was once a room used as a church. Yes, it just as creepy as it sounds. Life-size mannequins, dressed in black with blood coming from their eyes. I asked if they could be removed for the investigation, but they are actually bolted to the floor, so removing them was not an option. Whatever is in this room does not like women, many have been scratched, pulled, pushed and even bitten. Chainsaw Hallway, Basement. It is named this because during the Haunted House season, this is the area that guests have to make it through when someone jumps out with the horrible sounding chainsaw. Also the area where, in the first year of operation, the employee assigned to chainsaw hallway experienced one too many unexplained activates, left the chainsaw on the ground, walked out and never returned. Once the flood lights were turned off, we were given a Spirit Box and K2 EMF Meter. We convinced them to let the 2 ladies go together. My partner and I opted for the Hallway on the main floor as a starting point. If you have never used a Spirit Box before it is hard to determine what may be a radio station or an actual response from the other side. Believing in the possibility of evil spirits, I intentionally kept my questions less invasive and let them know we had no plans of staying longer than the 30 minutes we were challenged to. For the most part, this area was quiet for us until the very end of the 30 minutes when I announced we would be leaving and a clear voice was heard, saying “thank you” through the spirit box. With the prior investigations receiving negative and vulgar responses, I considered this a good start. Our next location was the Mannequin Room. Again we broke the rules a bit and asked that at least one of the employees stay just down the hallway and not return to the main lobby as we were pretty sure that we would not make it through the entire 30 minutes in this room. Again, the room was pretty quiet except for a sudden cool breeze (this room is in the middle of the building, no windows, no direct airflow) and the now flashing lights on the F2 meter, which senses some type of presence. The room felt very heavy, a sense of pressure in my chest making it hard to breath normally. My partner started feeling sick and we radioed for rescue. We made it 21 minutes. The final location, Chainsaw hallway in the basement. Talk about dark, there is absolutely no source of light besides the F2 Meter we are holding. The Spirit Box seems to echo off the walls making an even more creepy sound. Though we didn’t capture a spirit voice in this hallway, we did encounter something. We only made it 5 minutes down there before I felt a tug at my necklace and it felt as if it was lifted up and dropped back on my chest, the lights on the F2 speeding from green to red. I radioed for rescue, no more proof was needed for me. Earlier in the night I had asked the question out loud if anyone knew what was on my necklace, no response. The necklace I wear is the fingerprint of my sister who passed away in 2014. Even as I write this review, I am trying to debunk that movement of my necklace. Moving forwarded and leaning back, turning my head but cannot seem to make it do the same thing that happened in that hallway. 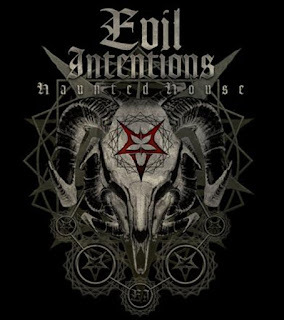 If you want to be a part of a paranormal investigation or see if you can make it through their “Haunted” Haunted House this fall, check out their website or Facebook page at Evil Intentions. Make sure you stay tuned because they have a BIG announcement coming up at the end of July 2017, only the most brave will be able to accept this challenge. Thank you Mike, Brock, Tyler and all of the Evil Intentions Crew for the amazingly terrifying experience!